While LCD has its place in the projection world, and many dedicated followers, I've long felt that its inherent weakness – black level response – makes it a problematic technology to use at the higher end of the market. Epson, though, is having none of this. Its flagship EH-TW5500 costs the best part of four grand, putting it in the same price ball-park as JVC's HD550 custom install D-ILA projector. Ouch. The TW5500's build quality is suitably luxurious, with its heavy-duty matt-black finish and no-nonsense shape combining practicality (it won't stand out in a darkened room) with a satisfyingly serious aesthetic. What really stands out about the TW5500, though, is its claimed 200,000:1 contrast ratio (and measured by our Tech Labs at a still very impressive 97,000:1). The answer to how this has been achieved lies in two main parts. 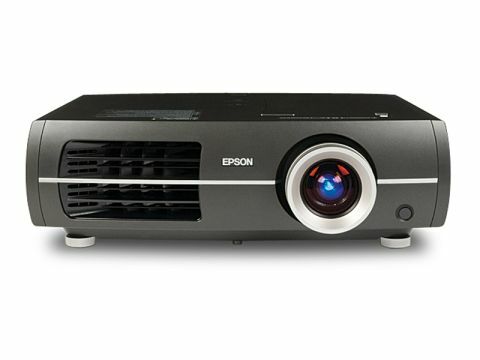 First, the latest incarnation of Epson's DeepBlack system means less light is 'lost' between the bulb and your screen. Second, you've got Epson's new dual-layer notched iris design, which reduces light in two quick stages as a film switches from light to dark shots, rather than just the usual single stage. This allows the Epson to deliver more drastic shifts in light output – and thus deeper blacks – without the usual, distracting 'brightness jumps'. Other important features of the TW5500 include 12bit HQV video processing (versus PixelWorks processing on the TW4400), ISF calibration support, third-party anamorphic lens support, and new frame interpolation processing. After a startlingly easy set up, thanks to a lovely 2.1x zoom and loads of vertical and horizontal image shifting, the TW5500 quickly has me eating my 'LCD can't do premium' opinion with a slice of humble pie. For starters, black level response is outstanding. There's practically no sign of the grey wash over dark scenes often seen with LCD projector images (including the TW4400), leaving blacks that look rich and credible. JVC's D-ILA based HD550 goes darker still, but it's a close call. The Epson's blacks also hold good shadow detailing despite their depth. The TW5500 also performs superbly with its colours, which are gorgeously nuanced and more vibrant than those of the TW5500's predecessor, the TW5800; the TW4400; and JVC's HD550. Sharpness is no issue either, as the TW5500's Full HD resolution and advanced processing allows HD material to appear with impeccable clarity and detail, yet without the grain and over-stressed edges you get with projectors that try too hard. Contributing to the sense of clarity is the Frame Interpolation processing, which substantially reduces judder while generating hardly any nasty processing side effects. The trick is that the TW5500's system is adaptive, reducing its power when it recognises that a particular scene is going to push it into causing artefacts. With the TW5500 also running extremely quietly in low-lamp mode, the only bad thing I can find with its performance is that occasionally it marginally loses focus without you touching anything. But aside from this piffling issue, Epson has succeeded in making me completely rethink my position about LCD's projector potential. And you can't say fairer than that.